Catholicism is the Truth. Here is Further Evidence. Thank God for the Catholic faith and the peace it provides to us humans as we traverse this valley of tears. The story below of an event in American history shows how the truths of the Catholic Church are meant to be known by all races and shared by all race. As it states in the story below, we know that “truth does not change; it is only forgotten from one generation to the next.” Our generation has sadly lost the knowledge of this truth. We have to bring it back to society brick by brick. A friend once lent me a book that I wish everyone else could read. Unfortunately it is not readily available. In fact, it has been out of print for almost 120 years. It is the memoir of Monsignor Augustin Ravoux, who served as a priest in Minnesota before the Archdiocese of St. Paul and Minneapolis even existed. It is an inspiring and thrilling account of the trials and triumphs of a remarkable priest, who was born in France in 1815, and found himself assigned to Mendota in 1842. His “little flock” was spread along the Mississippi and St. Croix rivers. They spoke English, French, Sioux and Chippewa. He worked with Fr. 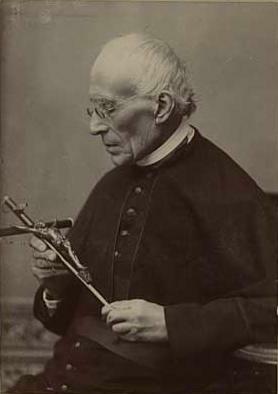 Galtier who had built the first chapel in St. Paul in 1841. He welcomed the first bishop of St. Paul, Joseph Cretin, in 1851, and upon Bishop Cretin’s death in 1857, he was the administrator for the diocese until the next bishop was appointed, and he assisted in the building of Minnesota’s first Cathedral. He describes his life as a frontier priest with rich understatement: “Though ever pleased with the mission entrusted to my care by Divine Providence, the path I had to walk in was not always strewn with flowers.” Msgr. Ravoux faced difficulties we cannot imagine. There were no developed roads, and he nearly drowned in the Mississippi on a trip to Dubuque, and nearly died of thirst crossing the prairies to Ft. Pierre. In the early years, the Chippewa and the Sioux were at war with each other, and Msgr. Ravoux had to find a way to minister to both tribes without alienating the other. He witnessed firsthand, the horrific tortures that the Sioux inflicted on their own people as part of their native religious practices, and worked hard to convince them that these practices were truly evil, including a few instances of human sacrifice. The Sioux for the most part were not very responsive to his missionary efforts. On the other hand, some things he talks about sound very familiar: teaching and defending the Catholic faith among “atheists, infidels, Protestants, and bad Catholics.” His arguments about faith and reason, the Catholic foundation of Scripture, the intercessory powers of Mary and the saints sound no different from those we use today. Truth does not change; it is only forgotten from one generation to the next. The most fascinating episode in the book, however, is an account of an infamous historical event – but with a surprising perspective that I certainly never learned in school. On December 26, 1862, the largest mass execution in the history of the United States took place in Mankato. 38 Sioux were hanged for brutally murdering white settlers during the Dakota Sioux Uprising earlier that year. The Sioux had killed almost 800 settlers in an attempt to drive the rest of them out of the Minnesota territory. While controversy continues to swirl around both the causes of the uprising and the subsequent events, there was one thing I never knew until I read this book: 33 of the 38 men who were executed had been received into the Catholic Church the day before. The priest who baptized them was Msgr. Ravoux. When the Sioux were given their death sentence, the colonel at the prison told them to choose the spiritual adviser they thought fit. They could follow their own native rituals in preparing for death, or seek out the two Protestant ministers who were present or the one Catholic priest, Father Ravoux. The two Protestant ministers knew the Sioux language perfectly, having ministered among them steadily for 25 years, whereas it had been 18 years since Msgr. Ravoux had last devoted any missionary effort to the Sioux, with whom he had never experienced much success. And since there were so few priests in the area, he had spent all of his recent years serving the Catholic settlers. Interestingly enough, the horrible event opened a door for Msgr. Ravoux that had previously been closed. It turned out that the condemned Sioux had gotten the word out to their friends and relatives to follow their example and embrace “the religion of the black robe.” A year after the execution, some 300 Sioux families were encamped around Ft. Snelling. Father Ravoux was welcomed into the encampment, and visited often. Almost 200 individuals were eventually baptized. We never know how God can use a tragedy for the Kingdom of Heaven, but we should always be prepared, no matter what.